What was Jesus like? Why the question? To know what Jesus was like or is like shows us how we are to act toward one another. When Jesus went ashore he moved with compassion and healed the people. So we see Jesus was very compassionate. Jesus said I feel compassion for the people because they are hungry and he fed the multitudes with seven loaves and a few fishes. Jesus shows mercy and forgiveness to the woman caught in the act of adultery. Where are your accusers? They are none, he said neither do I condemn you, go and sin no more. If you want to really see the personality of Christ his true divine nature look at the fruit of the Holy Spirit. But the fruit of the Holy Spirit is love, joy, peace, forbearance, kindness, goodness, faithfulness, 23 gentleness and self-control. Against such things there is no law. This is God’s nature. This is our nature now that we are new creatures in Christ Jesus. Our old nature has passed away. We now have the nature of God. Make allowance for each others faults, and forgive anyone who offends you. Remember, the Lord forgave you, so you must forgive others. The nature of God is forgiveness, even has Christ forgave us we are to forgive one another. We are to take on His nature. A new command I give you: Love one another. As I have loved you, so you must love one another. 35 By this everyone will know that you are my disciples, if you love one another.” What is a disciple? A disciple is a learner someone that copies his life after someone. We are to image Christ. To walk and speak His words that bring life to others. Let your words be always with grace, seasoned with salt, that ye may know how ye ought to answer each one. Let your words be with grace (unmerited favor) seasoned with salt. Always remember to say only the things that you believe Jesus would say. Let the Lord be lifted up through you that the world will know that God really does love them. 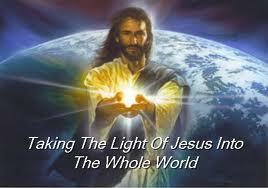 Be a bright light a beacon for the Lord.